The first product to result from an alliance between Finnish phone maker Nokia and software firm Microsoft has been launched. The Microsoft Communicator Mobile software allows business people to see colleagues availability and message them via e-mail, text, phone or IM. The firms will offer phones running Microsoft Office later in the year. The two firms announced the alliance - aimed at breaking the dominance of Blackberry - in August 2009. At the time, Robert Andersson said it was aimed at toppling market leader Research in Motion, the maker of the Blackberry, for business people. "This is giving some of our competitors - let's spell it out, Research in Motion (RIM) - a run for their money," he said at the time. "I don't think Blackberry has seen this kind of competition." The two firms were originally fierce rivals in the nascent smartphone market, but have faced increased competition from latecomers such as Apple. 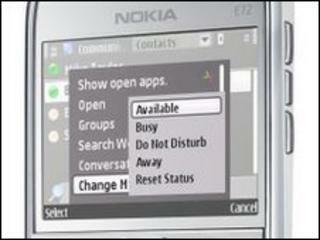 The new software will initially run on Nokia E52 and E72 phones running the Symbian operating system. Other handsets will follow. Microsoft Communicator Mobile has previously been available for phones running Java.